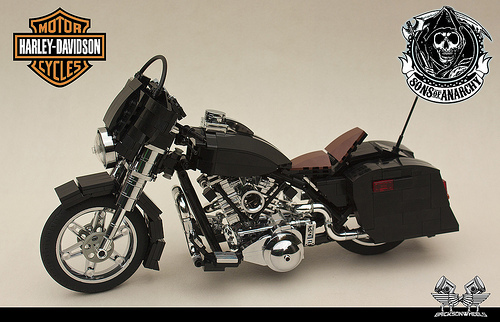 Try to avoid any unnecessary blow-back, constant reader, as you feast your bleary eyes on this 1:10 scale Street-Glide Special as featured on the biker-gang T.V. series Sons of Anarchy. The builder is one-percenter bricksonwheels who brings his signature style and skill to one of the bikes favored by protagonist Jax Teller. Now grab your ape-hangars and hit the road, we’ve got trouble with the Mayans.